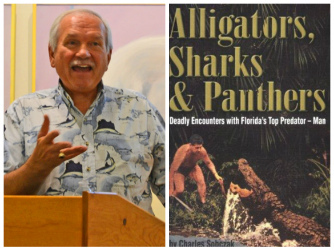 Please join us on Thursday, February 28 at 6 pm when author and lecturer Charlie Sobczak returns to Copperfish Books with a new wildlife PowerPoint presentation and his popular brand of “eco-humor.” Based on his 2007 award-winning book Alligators, Sharks & Panthers: Deadly Encounters with Florida's Top Predator – Man, Charlie's new lecture takes an in-depth look at how we can avoid being attacked by these wild animals. Copies of the book will be available for purchase. Sobczak will also take a close look at the most dangerous animal on earth -- us -- and explore the much graver risks we face moving forward, from pandemic to nuclear annihilation to the rise of tribalism. Combining humor with these more serious topics makes this a presentation that will be sure to keep you both amused and concerned about the future of all life on this amazing planet we share together. Charlie Sobczak has been a featured lecturer with Road Scholar and has presented to the The Conservancy of Southwest Florida, The Harvard Club and Sarasota Sierra Club, among others. Charlie’s lectures are memorable for their relevance and sense of humor. He lives in Sanibel, Florida.